Iran has the biggest hydrocarbon reserves in the world and deems itself responsible for the world’s energy security, said Zanganeh. 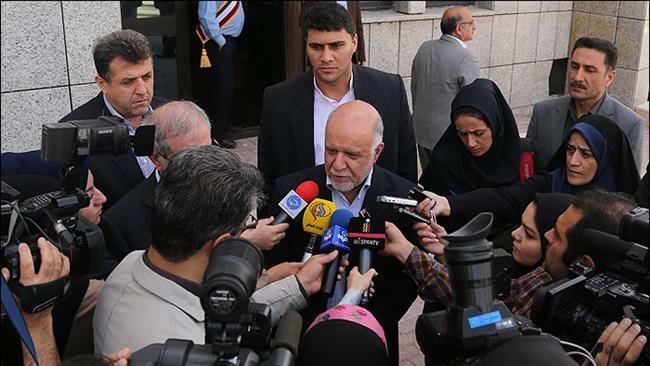 Minister of Petroleum Bijan Zanganeh says Iran will raise its oil recovery to 4.7 million barrels per day “in the near future” and unveil its new Iran Petroleum Contract (IPC) in the month which begins on Aug. 23. He made the announcement on Monday at a meeting with a delegation of German state officials and executives of industries and businesses headed by Economy Minister Sigmar Gabriel on their visit to Tehran. “Iran has the biggest hydrocarbon reserves in the world and deems itself responsible for the world’s energy security,” Zanganeh said. “Gas production in Iran will surpass 1,000 million cubic meters per day in the next three days. Moreover, oil production is expected to reach 4.7 million bpd in the near future,” he added. The country plans to restore its oil production which intensified Western sanctions have sliced by half. To achieve that goal, Iran has lined up new contracts in order to attract foreign investors to its ageing oilfields to ramp up output. Zanganeh said he hoped German companies would participate in Iran’s oil industry projects after the new contracts were announced. “Investment in the petrochemical sector, refining, storage, energy use optimization and development of new energies are among many of the projects which German companies will participate in,” he said. Executives from Linde, an industrial gases and engineering company, and Europe’s biggest engineering company, Siemens, are accompanying Gabriel along with representatives of other big German firms on the visit to Tehran. In a joint news conference with Zanganeh, Gabriel said it was time for Iran and Germany to “open a new chapter in economic ties”, the website of Ministry of Petroleum’s Shana news agency said. “Some people believe the effects of the nuclear agreement will not be tangible but we want to prove that this accord will kick-start economic cooperation and have positive impact on the life and prosperity of the people and lead to a boom in business,” it quoted Gabriel as saying. Zanganeh said Iran is also counting on small- and medium-size German companies for the implementation of projects. “For contracting and EPC (engineering, procurement, construction) contractors, it is in the best interests of the German companies to register in Iran and work along with Iranian firms,” he said. “Iran has a very valuable educated workforce which Germany companies can use,” he added. Zanganeh said the most immediate hurdle to bilateral trade was banking and insurance restrictions which the sanctions have created. The minister said Iran and Germany will soon hold their first joint trade meeting after a 14-year gap. German officials foresee bilateral trade, which totaled 2.7 billion euros ($3 billion) in 2014, expanding to 6 or 7 billion euros in 2016.